Welcome to the Education Community Portal. Contained on the 10 levels of this tower is the collective knowledge of a group of people on how to use virtual worlds as an effective educational tool. 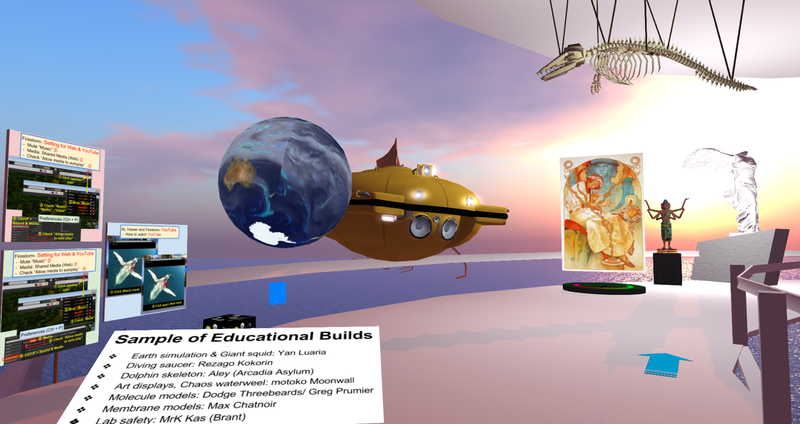 It allows you to see what other educators are doing, to examine the different tools and interactive objects used for education, to review the different ways educators use virtual worlds, and to understand the many lessons learned from years of using virtual worlds as an educational tool. There is a huge amount of information available at the portal and it is impossible to absorb it all in one or two visits. The portal is a resource that one visits repeatedly as their understanding of education in virtual worlds develops. The portal does not offer a basic orientation on how to operate in a virtual world. It is assumed you have completed such an orientation. If you still need to visit such an orientation, there are panels that will take you to orientation regions on the second level (Ground 2). There are instructions in the Ground 2 section below on how to use these panels to move (teleport) to different regions in Second Life and return to the Education Portal. This handout is meant to be a reference to help you quickly find information on a specific topic. It covers what topics are covered on each of the 10 levels. Each level is a ring and the information is organized in a clockwise direction starting at the landing site. Several levels have circles in the middle of the ring where additional information is available. On each level you will find a bright pink cone pointing up. Left click on this to teleport up one level. On the floors above the lowest level, you will also see a bright light blue cone pointing down, left clicking on this moves you down one level. Click on the square to see an image. The first three levels of the tower comprise the Ground levels and provide panels showing different educationally focused regions in Second Life that you can visit. Visiting these regions is a great way to get started in education in Second Life. You can see how other educators are using Second Life and develop ideas for incorporating virtual environments into your lesson plans. Do not be alarmed that the region you visit has no one there. Education regions tend to be active for only short periods when students are doing an activity. The lowest ground level (Ground 1) covers the regions with a STEM (science, technology, engineering, and math) focus. The middle ground level (Ground 2) covers regions with a humanities focus such as history, literature, and art. From Ground 2 you can teleport up to a separate area that has an excellent art history display. The top ground level (Ground 3) provides panels for recreations of different locations around the world covering Europe, Asia, the Middle East, Africa, North America and South America. To use these panels, first open the text (nearby) chat window (usually lower left corner of your screen). Then left click on the panel and in the chat window you will see a landmark for the region you wish to visit as well as a landmark for the Educational Portal. Left clicking on the landmark will allow you to teleport to the new region. Left clicking on the Education Portal landmark will allow you to teleport back to the lowest level of the portal. There are 7 levels above the 3 ground levels. The list below presents the themes associated with each level. This handout will discuss what is on each level. For some of the panels or items on these levels, when you put your computer curser over the object, the curser changes from an arrow to a hand with a pointing finger. This indicates that this object has more information embedded in it. To access this information, open your text (nearby) chat window and left click on the item. The information will appear in the chat window. Moving clockwise from the landing site the panels are grouped under the following themes. Near the landing site on this level you will see another pink cone pointing up. Left clicking on this cone teleports you up to another tower high in the sky. This tower has 3 levels devoted to art history. When you teleport to this tower, you initially land on the middle level. At the landing site you will see the familiar pink cone pointing up that teleports you to the upper level and a blue cone pointing down that takes you to the lower level. Next to these cones you will see a blue circle with the words Central Hub in the middle. Left clicking on the circle returns you to the lower ground level of the Education Portal. This level has two joined squares. 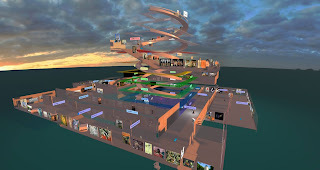 The square you land on has panels providing landmarks to many different art exhibits in Second Life. The other square has a lecture area with seating and several famous images of art displayed. There is also a piano. Left click on the piano bench and select “sit here” from the menu to get another menu. The second menu allows you to play the piano or accompany the piano as a singer. To stop playing the piano left click on “Stand” along the bottom left side of your screen. Back at the landing site on the middle Art History level you will find a pink and blue cone. Clicking on the blue cone takes you to the lower level. This is a long spiraling walkway illustrating art history from prehistoric times to the present. This exhibit was first developed by Comet Morigi of the Modern Museum and is recreated from the Motoko Museum of Art History. This is an amazing overview of art history and can easily take several hours to explore. You must move to the lowest level of the spiraling walkway to find the blue circle that takes you back to the landing site on the middle level. You can move down the long walkway or, if you are in a hurry, fly or jump down to the bottom. The pink cone next to the blue circle returns you to the top of the spiraling walkway. To use the blue circle, first open your nearby (text) chat window and then left click on the blue circle. You will see two landmarks in the text chat window. The top one takes you back to the middle level of the Art History Tower. The bottom one takes you to the very bottom of the Educational Portal tower. On this level you will see a memorial to Motoko Moonwall who was instrumental in developing the Abyss Observatory. You will also find a discussion on the development and layout of the Art History Museum that you found on the Lower Level. In addition, there is a panel that provides a landmark to the Motoko Museum of Art History. Unfortunately, there is currently no easy way to leave this level. So open your nearby (text) chat and click on the Educator Portal landmark you were given on the lower level of the Art History Tower to return to the lowest level of the education portal. Moving clockwise from the landing site the panels are grouped under the following regions of the world. Moving in a clockwise direction from the landing site, this level presents the following items. A discussion of the strengths and weaknesses of using virtual worlds as a teaching tool. An overview of some of the different ways educators use virtual worlds. A review of some of the cautions when bring students into a virtual world. The center of this floor has a lecture area with panels explaining how to use voice chat in Second Life. Moving in a clockwise direction from the landing site, this level presents the following three sections. The first section provides landmarks to regions that offer examples of how educators use virtual worlds. These are divided into three groups: STEM and Space, Biology and Environment, and History and Art. The second section provides examples of things people built to augment learning in the sciences and arts. It takes some skill in building to create these objects, and for objects that change as you interact with them it takes skill in scripting (writing computer code). It usually takes a year or so to acquire these skills. Provided you have funding you can, however, pay a builder to create an object for you if you have funding for this. The middle section shows a more complex interactive build, a medical room at a clinic, where students can engage in medical role play. This level provides you practical information about getting started in Second Life as well as instructions for using a variety of tools educators use in Second Life. Some of this information is often available at general orientations to Second Life, but reviewing this information when new to Second Life never hurts. Directions on how to get to these general orientation is provided on this level and is presented in the third section below. There is a lot of information offered on this level of the tower. If this is your first time to this level, first just see what general topics are covered so that you can return and get more information on a topic when you need it. There are 12 sections on this level. Notice that many panels have the word Touch over them. Left clicking on these panels will put text and URLs in your text (nearby) chat window. Be sure to have the window open. You can copy the chat text and paste into a Word document if you wish to save it. Moving in a clockwise direction from the landing site, this level presents the following section. The first section focuses on getting started in Second Life and covers the requirements your computer must meet to run Second Life successfully, how to get Second Life to work with a firewall (which many schools have), problems with students under 18 using Second Life, and how to get an avatar and get into Second Life. The second section discuss viewer selection. 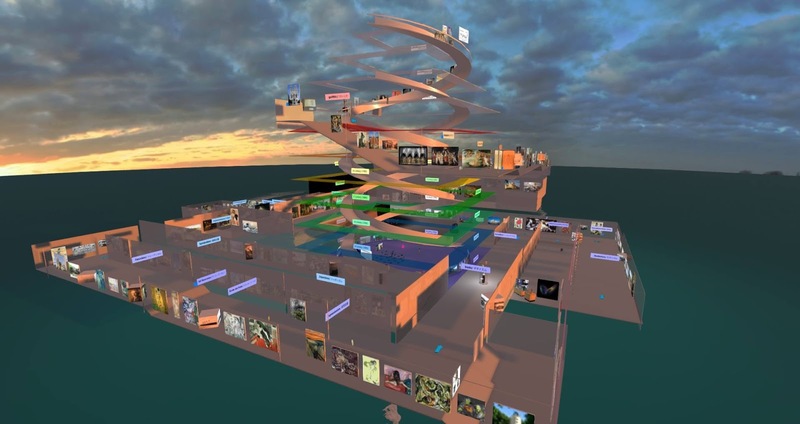 A viewer is the program you use to function in the 3D environment of Second Life. There are several different viewers, but this section provides the pros and cons for only two of them; the Standard Second Life viewer and the Phoenix Firestorm viewer. The third section provides access to some general orientations. If you have not done so already, please visit a general orientation. You will learn how to change the appearance of your avatar, how to fly and run, how to change clothes, how to interact with objects - like siting, how to buy things, etc. It is assumed you already have acquired these skills by the time you get to the Educators Portal. The panels in the third section provide landmarks for orientation areas in various languages so you can do an orientation in the language you are most familiar with. To get to one of these orientation areas, first left click on Nearby Chat so a window appears on your screen. Then left click on the panel in the language you want. A list of locations will appear in the Nearby Chat window. These locations are regions that offer an orientation in the selected language. To teleport to that region simply click on that location in the nearby chat window. Note that one of the locations listed is for the Education Portal. Left click on that to return to the bottom level of the portal. The next three sections (four, five, and six) cover the different ways to communicate with students: Text Chat, Voice Chat and Talking in Voice. The seventh section discusses moving around in Second Life. It covers how to get the SLURL (destination name) for a region and how to use your map controls to see where you are and who is nearby. Section eight concerns using media in virtual worlds. It covers how to show a webpage and how to show a YouTube video. Section nine covers how to interact with objects (something you might have learned at a general orientation). This can be found on the inside edge of the walkway across from section eight. Section ten explains how to work with images, either textures or snapshots. It explains how to move a JPEG file from your computer into Second Life. In addition it covers taking images in Second Life. Section eleven is across from section ten on the inner side of the walkway. It covers how to share objects in Second Life: such topics as how to open and obtain, buy, and copy objects are explained. Section twelve is the last section on this level. It explains how you take images that you have saved as textures or snapshots and move them into slide presentation screens. This level focuses on both the theoretical and practical aspects of incorporating virtual environments into a curriculum. Just like with any educational activity, it is best to start with a lesson plan that discuss what the students are expected to learn, how this information will be taught, and how student learning will be assessed. This level is designed to provide the lessons learned by educators who have worked in education in virtual worlds. Moving clockwise from the landing site, the first object is a web board. 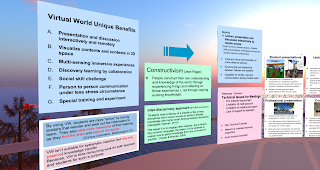 The URL shown on the web board provides an overview of lesson plan development in virtual worlds and show many examples of educational activities in Second Life. You should see the URL above the panel and can view this URL directly in a separate web browser if you wish. The next section provides landmarks to specific educational activities on several different regions. Visit these educational builds and see how different people have created focused educational activities that allow them to assess student learning. The following section concerns the six ways of learning discussed at the Bowness Island. These six ways are: Learning by Exploring, Learning by Collaborating, Learning by Being, Learning by Building, Learning by Championing, and Learning by Expressing. A landmark to Bowness Island is provided. Beyond the Bowness Island display are several panels with landmarks to additional educational builds in archeology, history, math and science. Natalie Nussle and Kevin Oh have conducted a training for teachers interested in using virtual worlds to augment special education classes. They published a paper from this experience and the lessons they learned are presented on the white panels along the walkway. Finally, there is a series of colored panels that offer advice for using virtual worlds as an educational tool. This advice comes from several people with years of experience using Second Life in their classes. 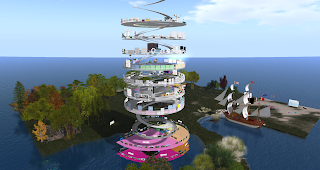 There are various educational organizations active in Second Life. Getting involved with them is a great way to network and get started using virual worlds as an education tool. Information of eight different education organizations is provided. Next to each webpage panel is an image. Left click on this image to teleport to the meeting area of this organization. Moving in the clockwise direction, the organizations are provided in this order. Information on four journals that publish articles on education in virtual worlds are provided. Example Builds: The first few sections show you examples of objects built from one prim (primitive or basic object). This section ends with a winding slide like build. How to Build: The next section provides you with landmarks to teleport to building and scripting (coding) tutorials so you can get started building. The two tutorials listed are the Ivory Tower and the College of Scripting. Another one that you can find in search is the Happy Hippo. These areas offer great instructions on how to get started making your own builds in virtual worlds. Oxbridge Caledon (one of the orientation regions for which the landmark is provided on Ground 2) offers basic building and scripting classes. Sharing Materials: This third section covers how to copy, buy, and open objects in Second Life. Click on the three boxes. Webpage on Building: This section offers a webpage on building. Most of the text on this webpage is in Japanese. Free Textures and Scripts: One aspect of building is to add textures to the object to give is a specific appearance, say wood, glass, stone, ect. You can also add scripts that make the object do something, move, give notecards, etc. This section provides free textures and scripts that you can copy into your inventory for later use. In this fifth section there a many textures available for free in the boxes. Touch the boxes to get the textures. In addition, along the outer side of the walkway there are five white squares that offer scripts that make objects move. Each square demonstrates a different type of movement. Lessons: The last section provides a series of colored panels that present lessons concerning building and campus management. These lessons are provided by Greg Perrier and come from over seven years of experience in education in Second Life. Sandbox: Finally, in the middle of the circle is a sandbox. A sandbox is an area where anyone can build an object. Once you finish building an object in a sandbox, right click on the object and take it to you inventory. If you leave it, it will be returned to you in two hours. To start building, click on “Build” on the top toolbar. In the drop down menu that appears, click on “Build” again. Moving your computer curser to the floor of the sandbox should make the curser look like a sparkler. Left click on the sandbox floor and a wooden cube should appear (this is the basic prim object). Right click on the box and select edit. Once in edit play around with the controls and see how you can change the shape, size, texture, color, etc. of this basic prim. You have now covered all 10 levels of information available in the Education Community Portal. As your skills and interest develop in using virtual worlds as an education tool, hopefully this information will prove useful.